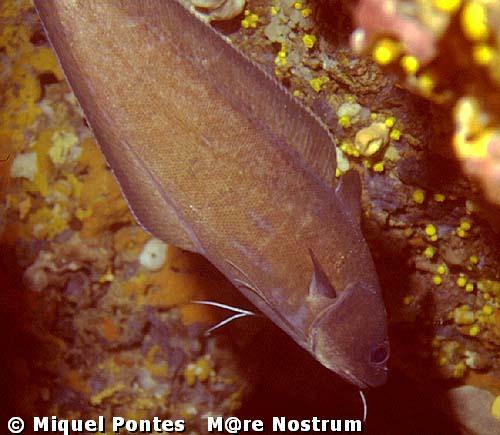 nown in Spain as "Brótola", this fish grows to about 2 feet long; it has a strong, elongated body, with a short rounded first and a longer second dorsal fin. The ventral fins are long and bifurcated in the last third of their length. The body is dark brown, lighter toward the belly. Under the chin hangs a gustatory (ie taste-sensing) barbel. Lives over rocky bottoms, though is not uncommon on sandy bottoms if there are rocks nearby. Almost always lives at great depths; rare in shallow waters. It has nocturnal habits, spending the day hiding in caves and holes. Feeds on small fish and invertebrates. Reproduces between January and May.